Let’s build some words! We’ve been working hard on letter recognition and playing phonics awareness games, and some children are showing an interest in writing words. I’ve made this as an independent play activity, but it could work equally well as a station during literacy rotations. We’re starting with simple CVC words using only the letters they have been introduced to so far in the phonics scheme. The day I put out the activity, I told the children what words the pictures correspond to. The letters they need are kept in the green basket (when they aren’t on the floor) and I haven’t put in any distractor letters. Ideally the learners would be able to look at the pictures and write the word themselves, but I’ve included 2 posters with the completed words to help them. 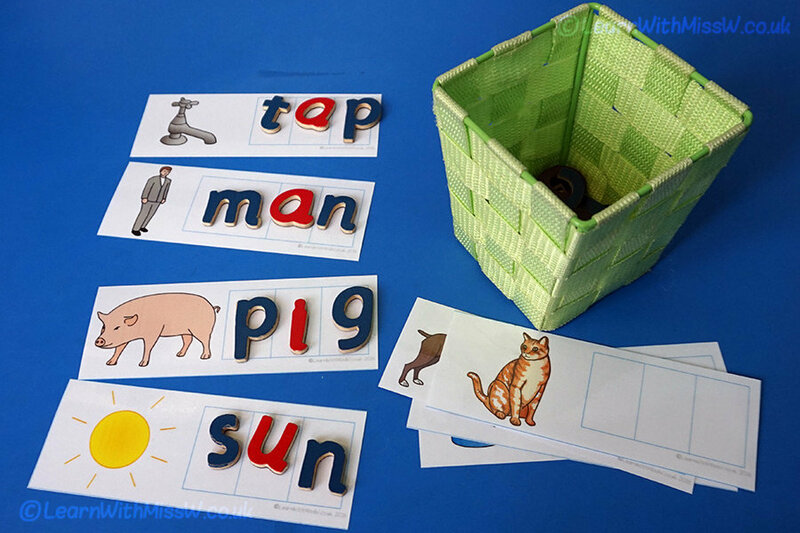 I have chosen to use wooden letters for this activity rather than letting them hand write because at this stage, many of the children in the class are not secure in their letter formation. I am not really encouraging them to write letters independently as I don’t want them to practise incorrect formation. We will practise forming letters during teacher guided lessons so I know they are developing good habits. If you’re interested, you can actually pick up a free copy of this game for your own classroom from my Teachers Pay Teachers online store: CVC build and write game. Please let me know what you think by leaving feedback.